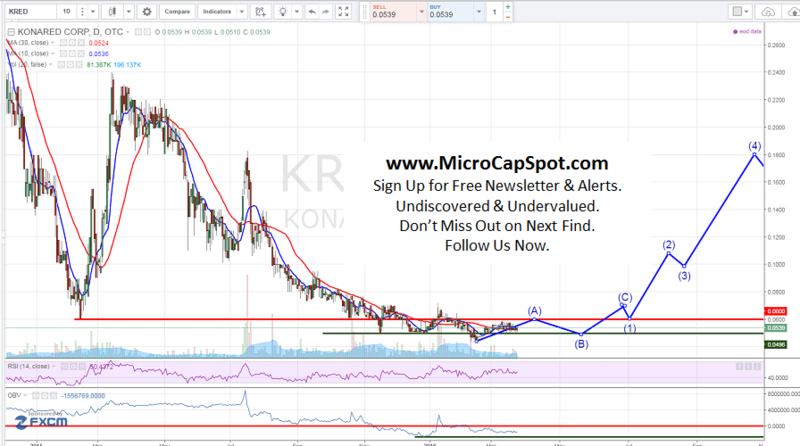 Konared Corp (OTCMKTS:KRED) investors should be excited given the string of recent developments and announcements made by the company. The stock has essentially flatlined over the last couple of months and stuck between a trading range. However, KRED put be poised for a huge breakout given the recent developments. The stock has plummeted from $1+ in 2014 to $0.04 in 2016. It current trades at $0.053 on relatively light volume of over 100,000 shares trading hands. In recent developments, Konared Corp (OTCMKTS:KRED) announced that it has officially launched its ready to drink cold brew beverages. Currently 24% of consumers drink retail-purchased cold brew coffee. The market for cold brew has seen a 115% growth in 2015 compared to prior year. KRED offering is currently available in three new flavors. The new product offerings is available in 12oz glass bottles, are refreshing, ready-to-drink coffees which blend premium coffee beans and Hawaiian coffee fruit. Cold brewed coffee is a new trend being labeled “fourth generation coffee” by the coffee industry and is created via a process in which roasted and ground coffee beans are steeped in cold water for over 12 hours. Konared Corp (OTCMKTS:KRED) has provided an update regarding Target distribution channel. KRED announced that it has been selected to continue its shelf presence at over 400 select Target stores across the nation through 2016. In started selling in Target’s mid-2015, through placement of the Company’s 16oz original beverage products onto the store shelves of Target locations nationwide. It is also available at select Kroger, Safeway, Target, Vitamin Shoppe, Whole Foods, Food 4 Less, 7-Eleven, Ralphs, and Fred Meyer stores, as well as many other retail locations throughout the U.S., Japan and Canada. In other news, Konared Corp (OTCMKTS:KRED) is expected to have an exhibit at Natural Products Expo West 2016. It will be showcasing its recently launched ready-to-drink (‘RTD’) Cold Brew Coffees which blend premium Kona and Colombian coffee beans and Hawaiian Coffeeberry® coffee fruit and are available in 3 new delicious offerings: Original Signature Blend, Hawaiian Vanilla and Espresso. KRED is an emerging leader in the U.S. coffee fruit category in the global functional wellness “Coffee Fruit” market. Studies demonstrate that the coffee fruit is actually an antioxidant powerhouse with the potential of increasing healthy energy and mental clarity. Starting from their first sale in 2009, KRED has shown transparency in the manufacturing process and the sustainability of its supply chain. KRED manufacturers of antioxidant juices, cold brew coffees and nutritional supplements from the unique and exclusive Hawaiian CoffeeBerry® coffee fruit from Kona, Hawaii. KRED is currently trading at a $6 million market valuation. The company has an exciting story in a rapidly growing segment of the beverage industry that is ripe for innovative drinks like KRED’s product offering. It sells any many national and international retail locations, expanding its product line, and developing a strong brand like Starbucks did. This has all the makings and ingredients of a company that could be worth five to ten times the current value. Stay tuned for more updates! We will be updating on KRED when more details emerge so make sure you are subscribed to Microcapspot so you know what’s going on with KRED. Disclosure: we hold no position in KRED either long or short at the publication of this article and we have not been compensated for this article.